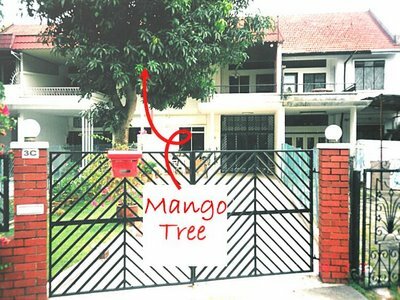 Mangos and I go way back - to my childhood days in beautiful Hong Kong, when my mother would buy them in bulk for us kids to eat. As they don't last long in tropical temperatures, we had to eat them up fast. Sweet though they were, obligation (and too much of a good thing) soured affection, and I left them alone till after living in Singapore. The house my husband and I rented had a mango tree in the front yard, and the falling fruit made a squashy mess on our driveway. 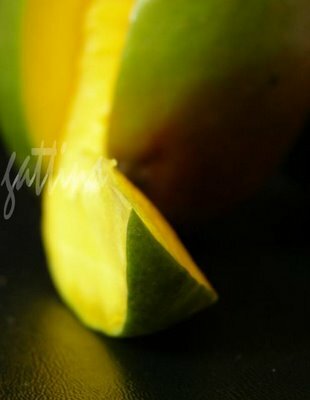 While the crows feasted, my husband collected the bruised mangos to throw away. Imagine our surprise when our neighbors asked us for these bags of (to us) rotten fruit! They cooked them in curries as the ideal sweet counterbalance to fiery spice. Mmmmm! 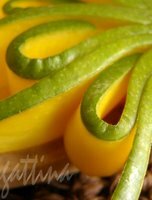 The mango became rehabilitated in my culinary estimation - it's natural sugars and brimming vitamins providing intriguing material for healthy desserts. Cut to America, 2006: supermarket discovery - Egad! Mango III! These big boys are more than a handful. Grown in Peru, they ripen green - unlike their more elongated Asian cousins that mellow to yellow when ready-to-eat. And at 75 cents apiece, who could pass up the chance to renew an old acquaintance? Firm flesh, toned-down sweetness, and a flowery bouquet - I was ready to create! 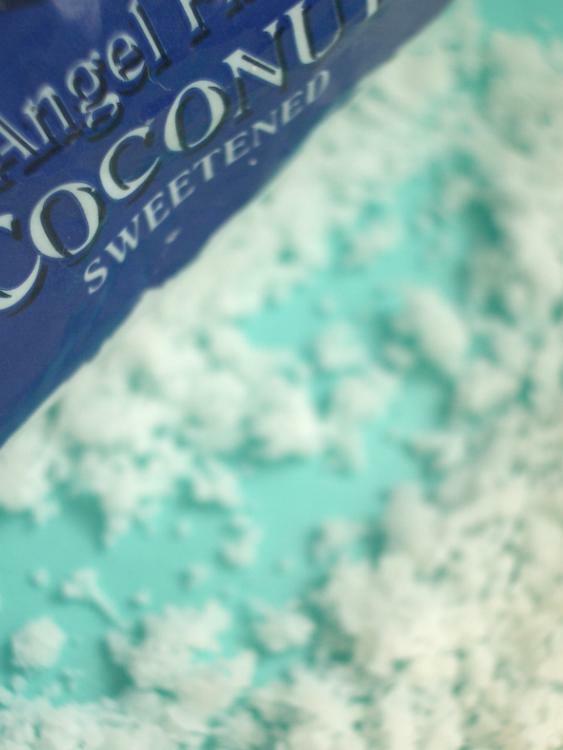 Another staple of Straits cookery is grated coconut. 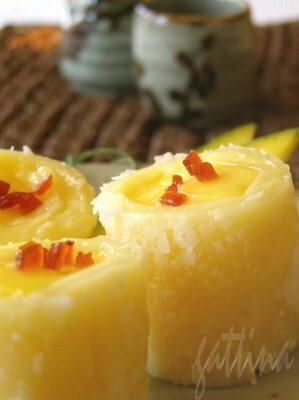 It's crunchy freshness complements the tangy softness of mango -- so in it goes, into a roll-up dough of glutinous flour, milk, coconut powder and sugar. This dough is very Chinese, steam-cooked and chewy -- but if a thin layer of baked sponge cake is more up your alley, feel free to substitute. Spread out your sheet of steamed dough (or cake) to cool. 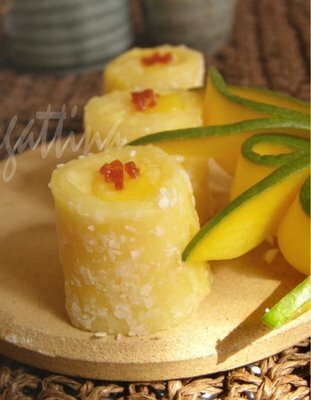 Then lay long strips of mango flesh at one end, smooth custard thinly over the entire sheet, and roll it up like sushi. Cover tightly with plastic wrap and chill for a couple hours before slicing. A light dessert of petit four that's natural, and deliciously refreshing! I discovered your site from mahanandhi and your posts are terrific. Especially the fotos are great.. I am interested in cooking chinese and thai at home so looking forward to your blogs.